Do you wish to transform In-Store & retail experiences in 2019? Download the brochure to ascertain how retail displays can create incredible retail experiences to leverage your retail space and increase impulse purchases. Push up your profits with brilliant merchandising displays. 30% customers find digital displays influential for purchase of a product. How Donatello Linea can help you drive up impulse purchases? How can you use Donatello for various retail applications? How can you ease customers’ retail shopping and checkout journey? 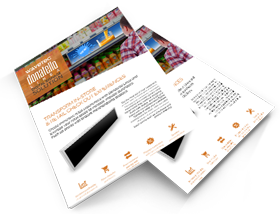 Download the brochure to know how retail displays can create immersive retail experiences!